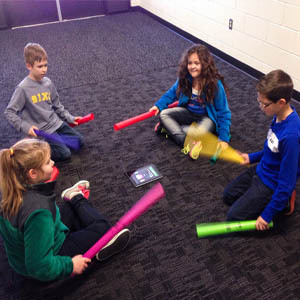 Not only does practicing music build our brains, we use music to explore lots of cool science, technology, engineering, and math activities! While Sound Curiosity is all about music education, we think it’s important to spend some time every meeting exploring questions of physics, math, biology, engineering, and tech — and how they’re all related to music. Then, about once a month, we take everything we’ve learned and use it on a special STEM+Music project. Why are bells different sizes? Why does a cello sound different than a violin? Every week, participants explore age-appropriate experiments to answer these questions and more. We Build Our Own Instruments Really! Why are phones and tablets so useful? Lots of creative engineers made them that way. That's why we explore STEM alonside music. How do our ears work? Why do some things sound good together when others don’t? Can you make a computer write music? Can you build a robot to play an instrument? Stand Back! Let’s Try Science! Every STEM activity will be a little different. Here’s an experiment you can do at home: Find a rubber band and strum it. Notice the sound it makes. Now listen as you stretch it and strum it again. What happened? Changing the tension on the rubber band changes the way it vibrates. Pulling on it makes it vibrate faster, which makes a higher pitch sound. Loosening up does the opposite. Congrats, now you know how the different strings on a guitar work! At Sound Curiosity, one of the beginning experiments we like to do is to dip handchimes in water to see (and hear) what happens. You can actually see the sound waves on the water! But that's not the only way you can see sound. In the video below, check out how we can use a special camera to see sound, heat, and other invisible things! Check out how we can use a special camera to see sound! (h/t NPR).